In Part I of our blog we reported on dual receptor agonists targeting the incretin/glucagon system to treat obesity and type 2 diabetes mellitus with high efficacy. So far, it has been recognized that the concept of combined targeting of gut hormone receptors is also working in humans [1, 2]. In Part II we will focus on the twincretins GIP and GLP-1  to improve glycaemic control and the tri-agonists GLP-1/GIP/Glucagon to treat obesity, type 2 diabetes mellitus and hepatosteatosis [non-alcoholic steatohepatitis (NASH)]. The glucagon peptide family members [GLP-1, GIP and glucagon] have similar peptide sequences, permitting the development of single-sequence multi-receptor agonists . This family has attracted attention through their ‘tissue-specific’ distribution of the incretin/glucagon related receptors which show unique effects and play a role in the variation in their respective functions. 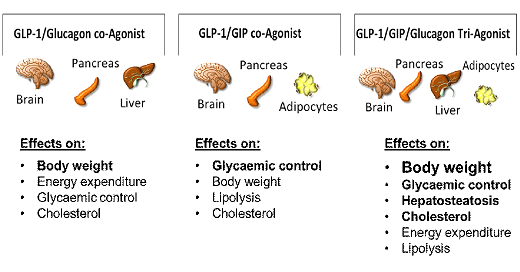 Receptors for GIP, GLP-1 and glucagon are present in a wide variety of organs in addition to the pancreas, including fat tissue, bone and within the brain. 50-70 % of insulin secretion following a meal intake is a result of the incretin effect. After bariatric surgery we learned that metabolic improvement occurred long before significant amounts of fat mass have been lost. The incretin effect is significantly blunted in type 2 diabetes mellitus (T2DM) and restoration of this incretin signalling could be effective as a treatment strategy for diabetes, obesity and metabolic dysfunctions [5, 6]. In addition, glucagon has re-emerged as a significant contributor to glucose homeostasis and energy metabolism . The two incretin hormones GIP and GLP-1 co-agonists (twincretins) show similarities and differences. GIP secretion from K cells of the small intestine is enhanced in response to ingestion of meals or glucose . Within the pancreas, GIP and GLP-1 together promote β-cell proliferation and inhibit cell death, thereby resulting in pancreatic β-cell mass-increase, while GIP enhances postprandial glucagon response and GLP-1 suppresses it [9, 10]. In people with T2DM, the GIP response is enhanced , whereas the GLP-1 response is reduced compared to healthy people . Although its full physiological role remains unknown, enhancement of glucagon secretion and impairment of insulin secretion in response to GIP administration hinders the development of mono-GIP-directed therapies. However, dual GIP and GLP-1 receptor agonists showed better efficacy with regard to glucose control and weight loss with an acceptable safety and tolerability profile . In bone, GIP may be a critical factor linking meal intake and bone formation  while GLP-1 has no direct effect on bone metabolism and inhibits bone resorption indirectly through upregulation of calcitonin . GIP-agonism has no effect on cardiac ischemia, despite stimulating hormone-sensitive lipase phosphorylation and fatty acid oxidation, supporting the cardiac safety of GIP receptor agonism (RA) for use in multi-receptor agonism. In fact, GIP administration limited angiotensin II-stimulated cardiac hypertrophy and fibrosis . In the brain, both GIP and GLP-1 are thought to be involved in control of appetite . GIP receptors in the brain can, when stimulated, reduce food intake and bodyweight in animals [15, 16]. Both GIP and GLP-1 could proliferate neuronal progenitors, thereby enhancing memory formation. In addition, GLP-1 is protective against neuronal cell death [17, 18]. Adipose tissue strongly enhances GIP secretion  and GIP levels are high in obese people with T2DM; GIP but not GLP-1 facilitates fat deposition. The GIP receptor is highly expressed in adipose tissue, and acute infusion of GIP under conditions of high insulin and modest hyperglycaemia increases adipose tissue glucose uptake, blood flow, and triglyceride hydrolysis in humans [20, 21, 22]. Although the mechanisms are not yet fully understood, rodent and human studies show that GIP plays a role in the regulation of lipolysis and lipogenesis in adipose tissue, which could contribute to improved lipid homeostasis and whole body energy metabolism [23, 24]. Therefore, GIP might increase metabolic flexibility by enabling increased fat utilisation in the fasting state and reducing fat availability in the postprandial state [24 25]. An even more advanced step towards the generation of an effective anti-obesity pharmacotherapy is the report of a single peptide capable of simultaneously activating the receptors for glucagon, GLP-1, and GIP by using a highly effective, balanced triagonist structure . The solubility and pharmacokinetics of the triple agonist were enhanced by iterative residue changes . The balanced unimolecular tri-agonist proved superior over any existing dual co-agonists and best-in-class monoagonists to reduce body weight, enhance glycaemic control and reverse non-alcoholic steatohepatitis in preclinical research [25, 27, 28]. Importantly, the triagonist also lowered fasting blood glucose levels and improved glucose tolerance without inducing hypoglycemia. This could indicate that the GLP-1 receptor agonism successfully counters the acute hyperglycaemic effects of glucagon agonism, while chronic glucagon agonism promotes body weight loss and improves in glucose tolerance . Balance of the triagonist in regards to glucagon was important to achieve the full weight loss benefits, suggesting no adverse effect of glucagon receptor agonism in this peptide. First clinical data on a triagonist compound are available . In addition, data of a unique long-acting triagonist were recently presented in preclinical DIO mice models of T2DM. This triagonist offered additional benefits for lipid metabolism and significantly reduced plasma cholesterol and reduced markers of non-alcoholic steatohepatitis (NASH) . Additionally, it was demonstrated that the long-acting triagonist protected against Parkinson disease in mice by attenuating microglial activation and inflammation in the specific brain regions . It is currently being tested in early clinical trials for obesity and NASH. These individual unimolecular multi-agonists activities seemed to harmonize the overall metabolic efficacy, which predominantly results from synergistic glucagon action to increase energy expenditure, GLP-1 action to reduce caloric intake and improve glucose control, and GIP action to potentiate the incretin effect and buffer against the diabetogenic effect of inherent glucagon activity. 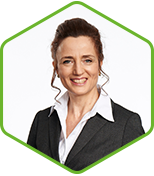 This multi-agonist strategy has potential to become the most effective pharmacological approach to reversing obesity and related metabolic disorders [32, 25]. So far, several unimolecular dual and triple agonists are in clinical evaluation and as of today, the improved metabolic efficacy does not seem to be compromised by reduced safety .